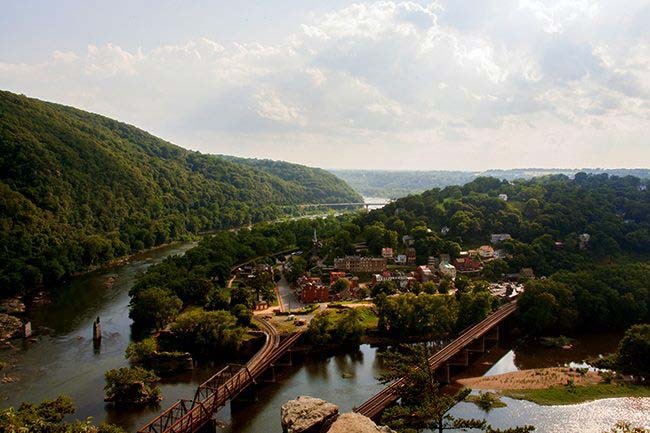 The Two Rivers Giving Circle—named for the confluence of the Potomac and Shenandoah rivers—is one of the few funders in the Eastern Panhandle of West Virginia that provides small grants to support natural resource conservation and historic preservation programs and projects. Each member of the Giving Circle makes a tax-deductible donation of $500 or more to the Community Foundation annually. During the past ten years, grants totaling more than $81,000 have been awarded by the Two Rivers Giving Circle Fund to a wide variety of nonprofit organizations, schools, and government agencies that are supporting these causes in our community. Doug Perks, center, received the 2018 Two Rivers Giving Circle Preservation Award. With Perks are the following Giving Circle members, from left to right: Virginia Rowzie, of Charles Town; Eleanor Finn, of Shepherdstown; Jane Davis, of Berkeley Springs; and Dan Rowzie, also of Charles Town. Founded in 2008, the Two Rivers Giving Circle recognizes individuals that champion conservation and preservation programs in the region, and awards grants to fund organizations that focus on conservation and preservation projects. 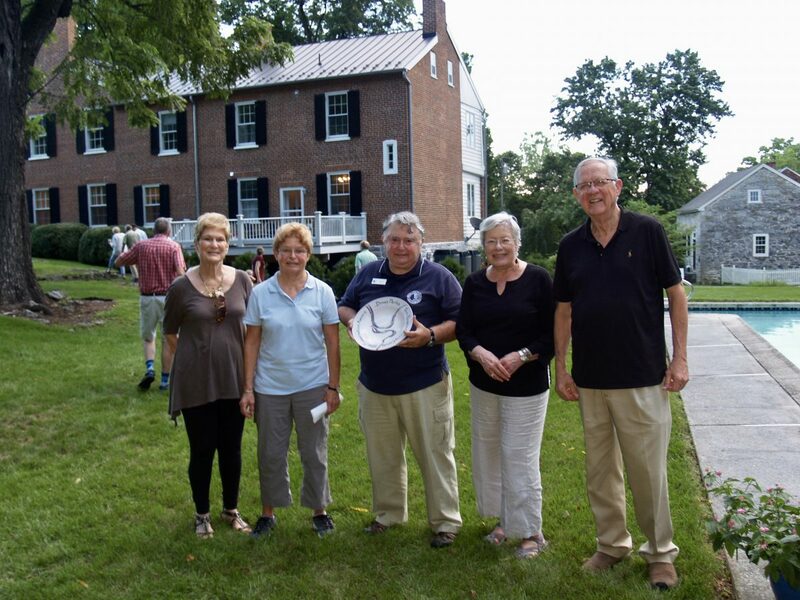 The 2018 Award presentation took place during the Jefferson County Historical Society’s annual picnic in Shepherdstown. The Giving Circle is one of the few grantmakers in the region that focuses on conservation and historic preservation. Each member of the Giving Circle makes a tax-deductible donation of $500 or more to the Community Foundation annually. The Giving Circle brings together committed, concerned and charitably-minded citizens to focus on local conservation and preservation grantmaking in Jefferson, Berkeley and Morgan counties. By pooling their resources, members of the Giving Circle are able to have a much greater impact on the causes that matter to them. Nonprofit organizations and local schools submit grant applications to the Community Foundation throughout the summer. Members of the Giving Circle meet twice in the early fall to review applications, discuss the proposed projects, research the applicant agencies, and recommend grants. We hope you will consider becoming a member of the Two Rivers Giving Circle. To join, simply mail a $500 check, payable to the Eastern West Virginia Community Foundation (EWVCF) to 229 E. Martin Street, Suite 4, Martinsburg, WV 25401 and write “Two Rivers Giving Circle Membership” on the memo line. Include your contact information, name, phone number, and email address; and we will keep you updated on the meeting schedule so you can participate in the grant selection process. Membership is open to anyone interested in supporting natural resource conservation and historic preservation efforts, educating residents about the importance of nature, energy conservation, and much more. To learn more about the Two Rivers Giving Circle please download our Two Rivers Giving Circle Membership Flyer. The Two Rivers Giving Circle is a charitable organization that fills a critical need. We’re one of the few local sources of grants for Eastern Panhandle nonprofit groups that are engaged in historic preservation and natural resources conservation. The funds for our grants come from the annual contributions of Giving Circle members and donations from friends, which are all pooled together. Those who choose to become members don’t just contribute: they also take a hands-on approach to the Circle’s grantmaking, helping to solicit and review grant proposals and to decide which proposals will be funded. This is a great way to become more involved in the community and to learn more about the process of philanthropy. Whether you choose to be a member or a donor, participation in the Two Rivers Giving Circle is a meaningful and rewarding way to give back to our community. We hope you will consider joining or donating so we can expand the Circle’s efforts and all do more together. APPLY FOR A GRANT each summer before September 16th. Nonprofit organizations, government agencies, and schools that are interested in applying for a grant can download the Two Rivers Giving Circle Grant Application here. $1,500 to the Town of Bath for greenspace infrastructure and improvements to help minimize flooding in downtown Berkeley Springs. $2,500 to Jefferson County Museum to stabilize, conserve, and display the flag of the Green-Copeland American Legion Post 63, an African American organization formed in Charles Town in 1929 by Edward Tolbert and other Jefferson County World War I veterans. $3,000 to Jefferson County Historic Landmarks Commission to help cover some of the cost of asbestos remediation at the Duffields Depot in Jefferson County. $1,000 – Martinsburg High School to assist teacher Derek Gallagher build a raised garden. $1,200 – Driswood Elementary for Potomac Valley Audubon Society programming. $1,500 – Jefferson County Historic Landmarks Commission for WVGeoExplorer Project. $500 – Warm Springs Watershed Association as recommended by Betty Lou Harmison. $2,000 – Jefferson County Historic Landmarks Commission for stabilization of the historic Cement Mill Site. $1,300 – Potomac Riverkeeper Network for North Mountain Stormwater Assessment in Berkeley County near Gerrardstown. $2,500 – Potomac Valley Audubon Society for assistance with signage and marketing the new Cool Spring Preserve property in south Jefferson County. $1,220 – Spring Mills Middle School for an environmentally friendly water bottle refill system with a water cooler and reusable water bottles. $ 850 – Wind Dance Farm & Earth Education Center for field trip bus transportation to the Morgan County environmental education facility. $2,500 – Berkeley County Historical Society for an archive computer, supplies and other equipment. $1,675 – Cacapon Institute for Potomac Headwaters Leaders of Watersheds (PHLOW) – conservation, education, and tree planting program in the Eastern Panhandle. $2,000 – Historic Shepherdstown Commission for continued repairs to the stone walls at the Shepherd Family Graveyard. $2,000 – Jefferson County Black Historic Preservation Society to cover partial expenses to install a backyard garden and brick patio at the historic Webb-Blessing house. $3,488.23 — Jefferson County Historic Landmarks Commission to support digitizing materials for historic preservation. $1,192 — Jefferson County Museum to support a new project called “History à la carte” to promote children’s interest in history. $1,000 — Morgan Arts Council to support “Water, Ecology, and Nature” artist program for schools and summer camp. $1,000 — Martinsburg Library to support “This Land is Your Land”, an environmental awaremess program for children. $1,000 — Potomac Valley Audubon Society to support design, purchase, and installation of interpretive signs for Stauffer’s Marsh. $360 — Charles Town Health Right, Inc. to support a safe drug disposal program. $1,694.85 — Shepherd University and its Historic Preservation Program to sponsor hand-on experiential learning for students in restoration of area historic graves and graveyards. $2,500 — Potomac Valley Audubon Society to seed a “Wee Naturalist” conservation-education program offered in preschools in Jefferson and Berkeley Counties. $2,500 — Morgan County Solid Waste Authority to offset costs for glass recycling in that county. $2,500 — Berkeley County Historical Society to purchase storage units for historic documents. $2,000 — Shepherd University in partnership with Shepherdstown Elementary School to develop a two-day scavenger hunt for fifth-graders. The program integrates photography with local architecture, natural sites and historic places in the Shepherdstown area. $993.95 — Warm Springs Watershed Association based in Berkeley Springs to design, print and distribute a new informational brochure about local watershed importance and protection. $2,000 — Craftworks at Cool Spring to launch a citizen-based invasive species education and management program in Jefferson County. $500 — Friends Wilderness Center to offset costs for materials for repair and renovation of a tree house retreat center. $2,000 — Jefferson County Historic Landmarks Commission to purchase a computer server for the GeoExplorer project to enable local citizens online access to historic records. $1,500 — Potomac Valley Audubon Society to seed a new in-school environmental education program for 2nd graders in select area schools. $1,500 — Berkeley Springs High School AP Environmental Science Class to establish a school-wide recycling program. $1,500 — Martinsburg-Berkeley County Library to help support an after-school ecology club program in the children’s library. $800 — American Conservation Film Festival to support a photographic safari for children at the group’s annual film festival. $2,021.97 — Elks Run Study Committee to help build outreach and communication to local citizens regarding the importance of Elks Run Stream and its watershed. $2,175 — Morgan County Solid Waste Authority to assist with the purchase of equipment to open and operate a permanent recycling center to serve Morgan County. $2,125 — Potomac Valley Audubon Society to help develop and offer a new pre-school program at the Yankauer Nature Preserve.